If one visits the church today, he will observe murals of Caesar Augustus and of the Tiburtine Sibyl painted on either side of the arch above the high altar. These images recall the oracle, which prophesied the advent of the Hebrew “Firstborn of God.” In the fifteenth century, this church became famous for a statue of the Christ Child carved from olive wood taken from the Garden of Gethsemane outside Jerusalem. The church’s connection to the birth of Christ made it a fitting place for devotion to the infancy of the Savior. Meanwhile in the Jewish district of Rome, on the day of Christ’s nativity, a fountain of oil flowed out from the earth in the tavern of a certain man in what is today called Trastevere—the region south of the Vatican and to the west of the Tiber River. This fountain of oil revealed to the Jews of Rome that the Messiah had at last been born, since Messiah or Christ means “anointed with oil.” To this very day, the Church of Saint Maria in Trastevere marks the location. The Emperor Septimius Severus, who reigned from A.D. 193 to 211, granted the location to the Christians. In A.D. 220, Pope Saint Callixtus I established the site as a church, and his relics still remain under the church’s high altar. The church has been rebuilt several times and can still be visited to this very day. 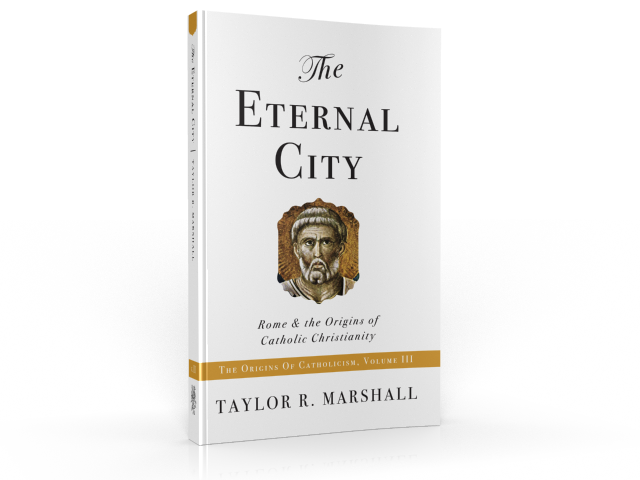 There are just a couple of interesting connections between Christ and Rome. This post is derived from Dr. Taylor Marshall’s brand new book: The Eternal City: Rome & the Origins of Catholic Christianity. Please continue reading here. [i] Quoted by Cornelius a Lapide in his Commentary on Luke at Luke 2:1. [ii] This tradition is confirmed by Baronius, citing Suidas, Nicephorus, and others, in the materials of his Annals.